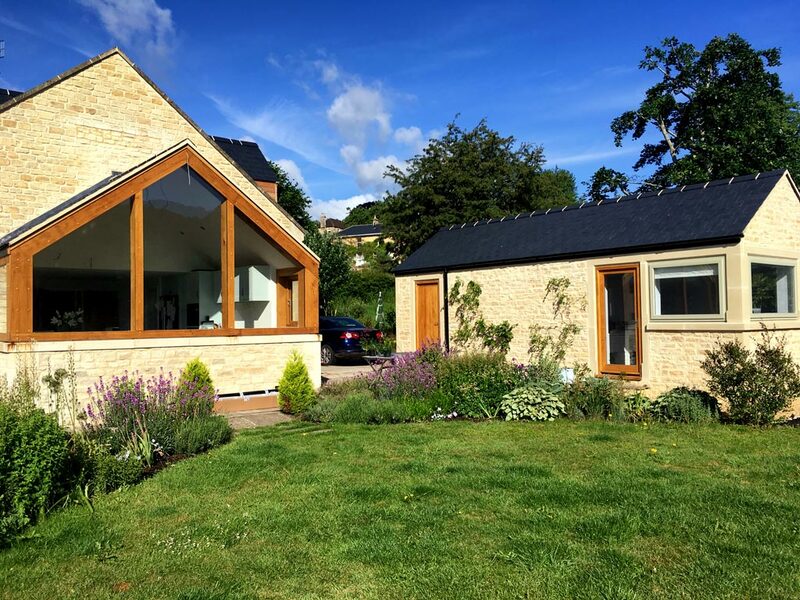 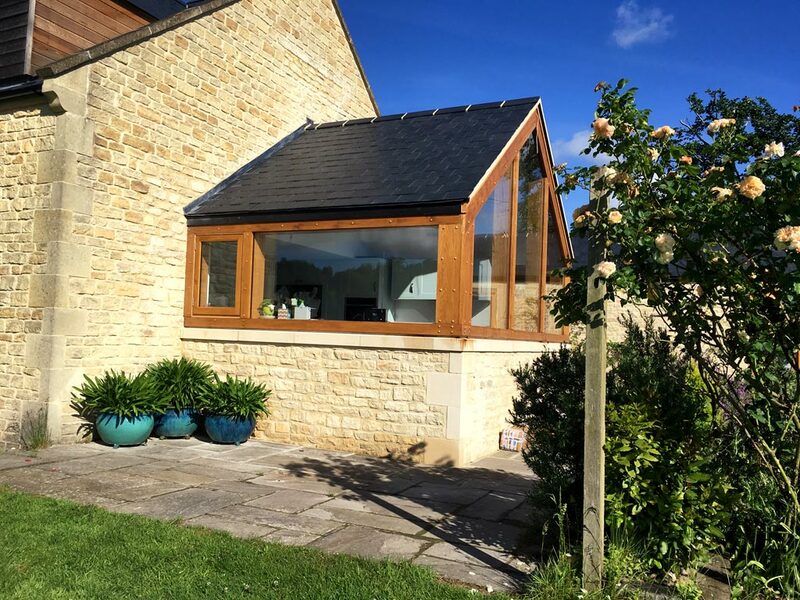 During this project a 3x4m stone/oak/glass kitchen extension was added on to a substantial family home. 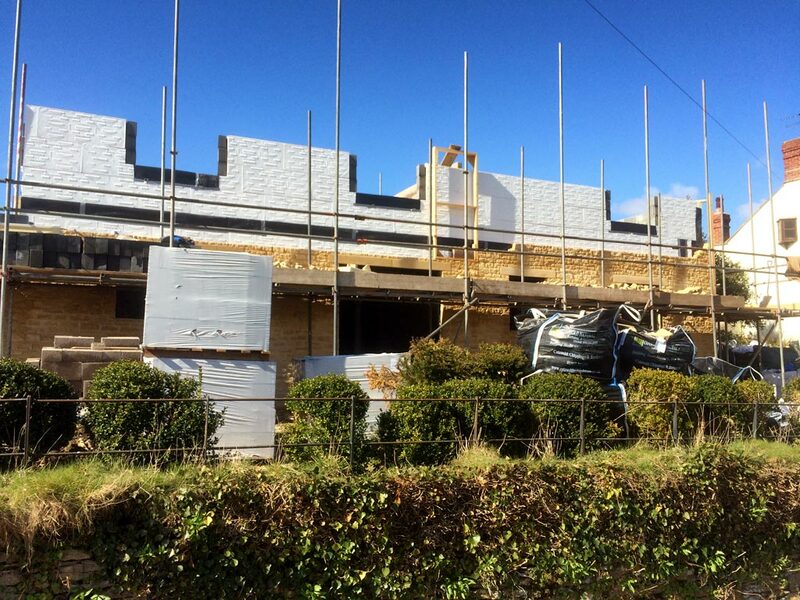 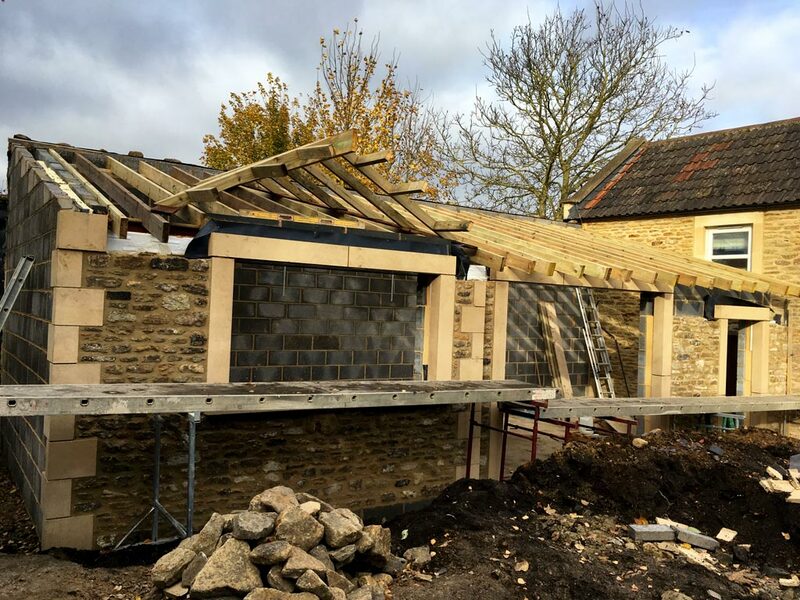 A stone garage was also built on the foundations of a former wooden garage, which Rob Moore and his staff demolished. 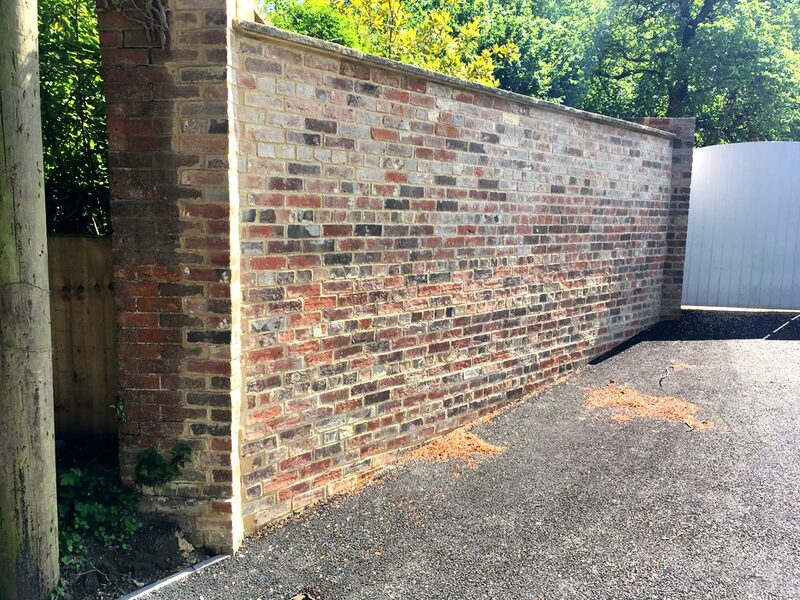 They subsequently added an office building to the back of the new garage. 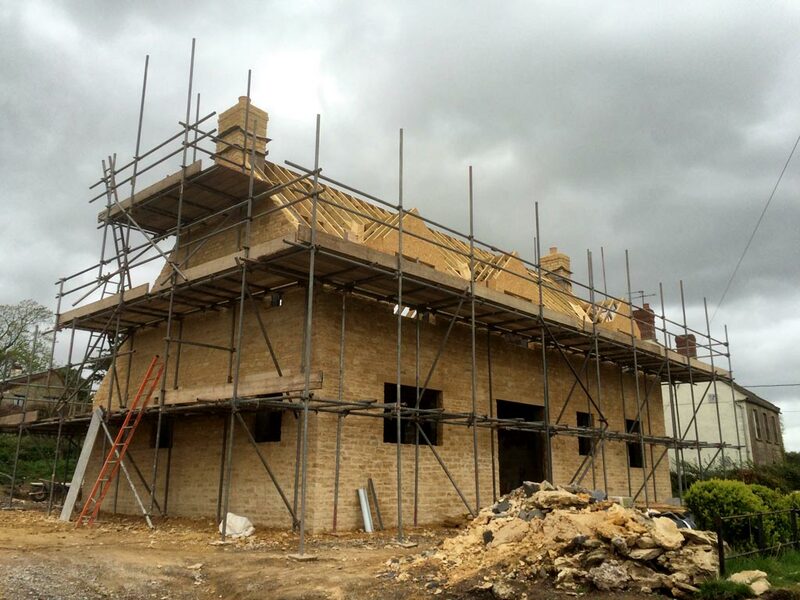 All buildings were constructed in cream coloured Cotswold stone. 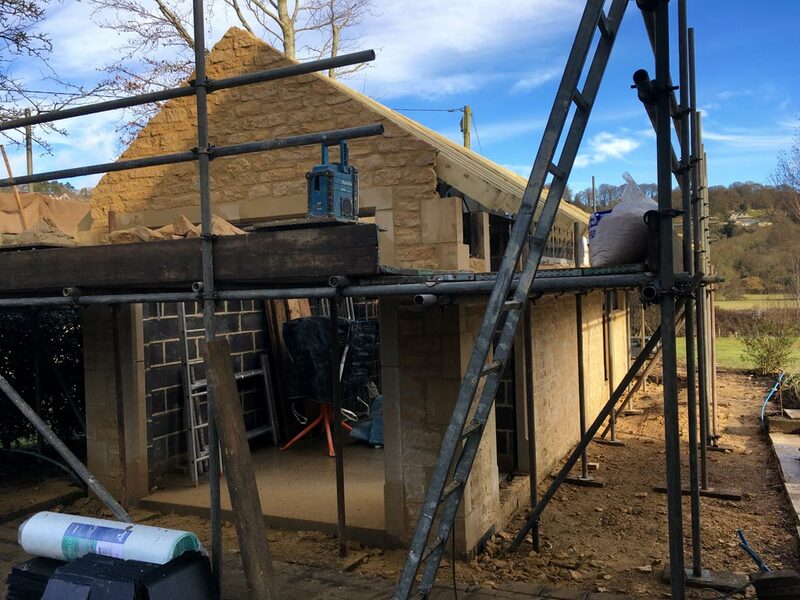 During a project that commenced in December and was completed by the following April, when it was handed over to the carpenter to complete, Lockleigh also initially removed a rear boot room before the construction work could begin on the new kitchen extension. 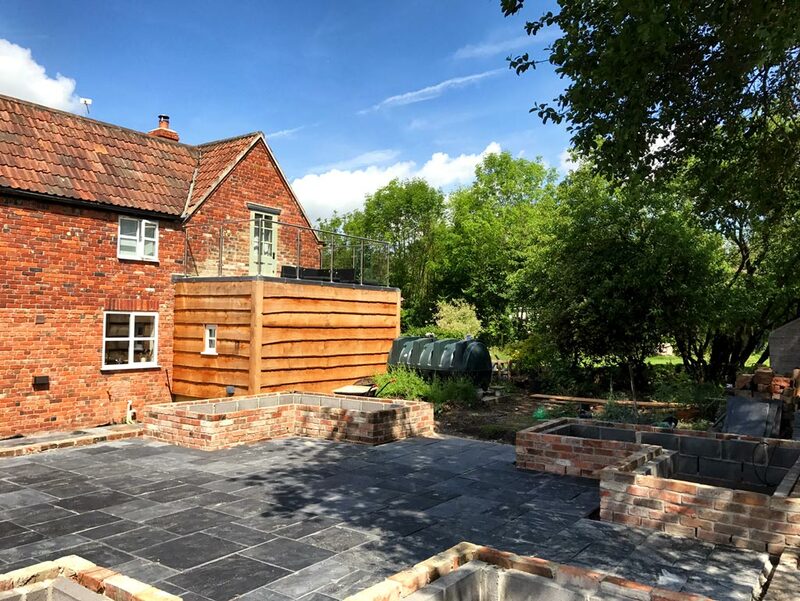 This attractive three-bedroom house was built in a quiet Somerset village in a former garden plot. 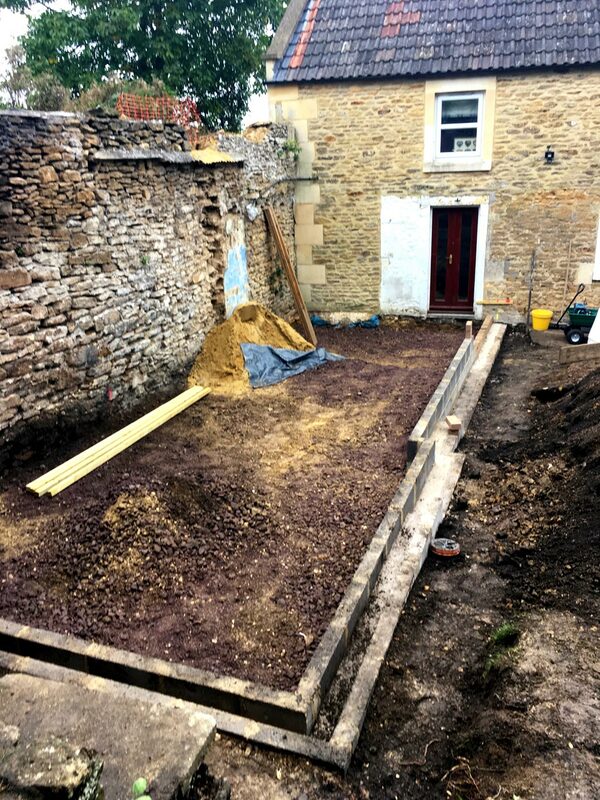 Lockleigh excavated and laid the foundations, and then built the house in random sized Cotswold stone. 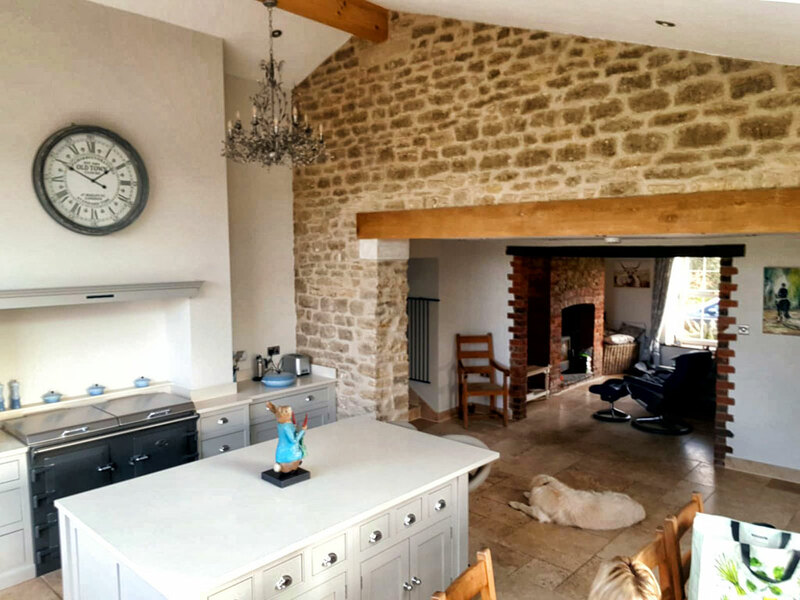 The house boasts five downstairs rooms, including a sitting room with a vaulted ceiling, and a large and imposing kitchen with living space. 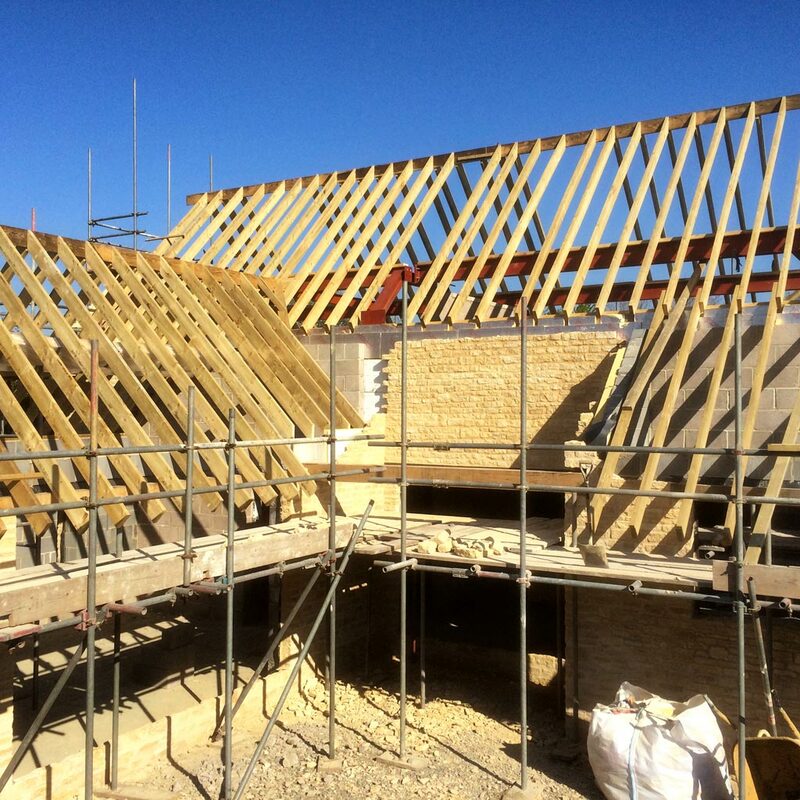 During construction Lockleigh brought in a crane to lift the steel supporting purlins to allow for the vaulted ceiling feature upstairs. 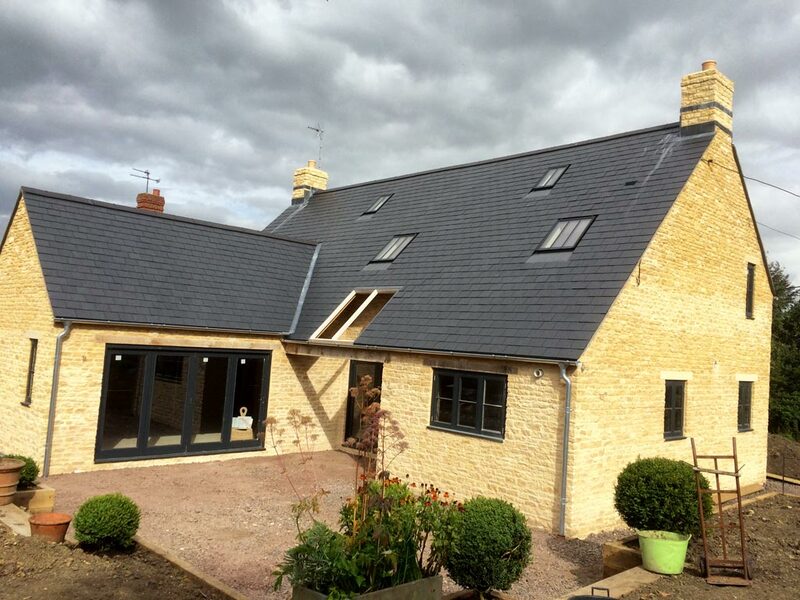 The company also constructed the traditional roof, incorporating roof lights and stone chimneys. 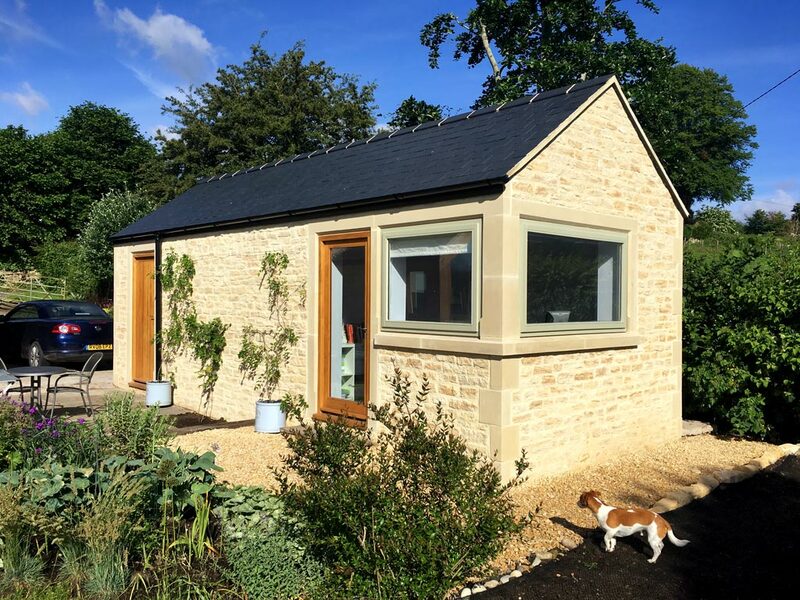 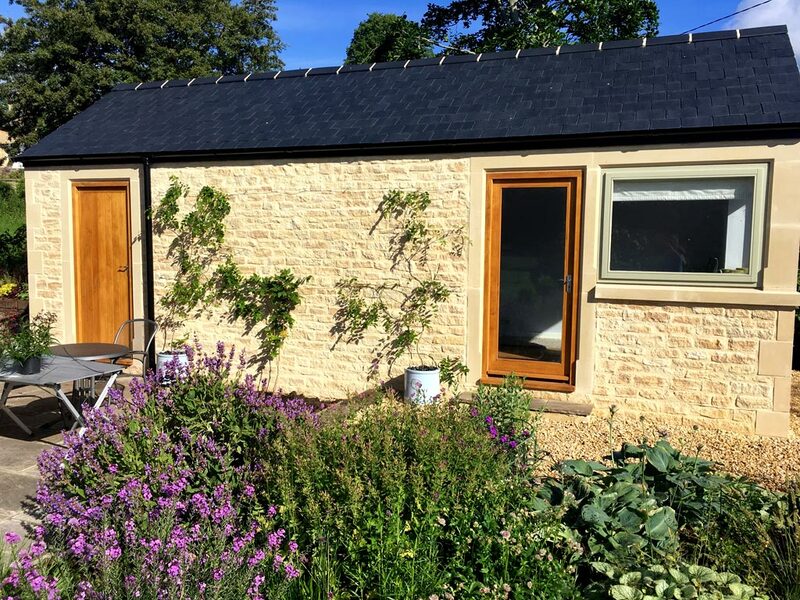 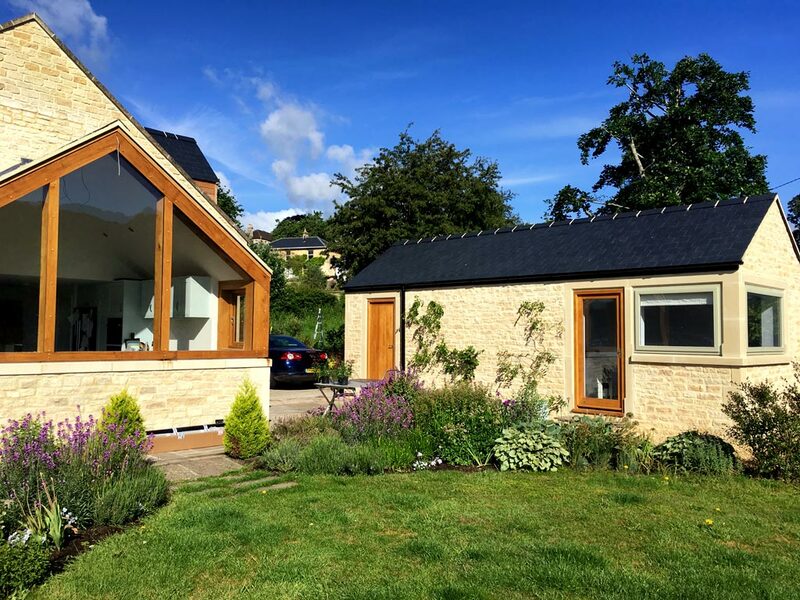 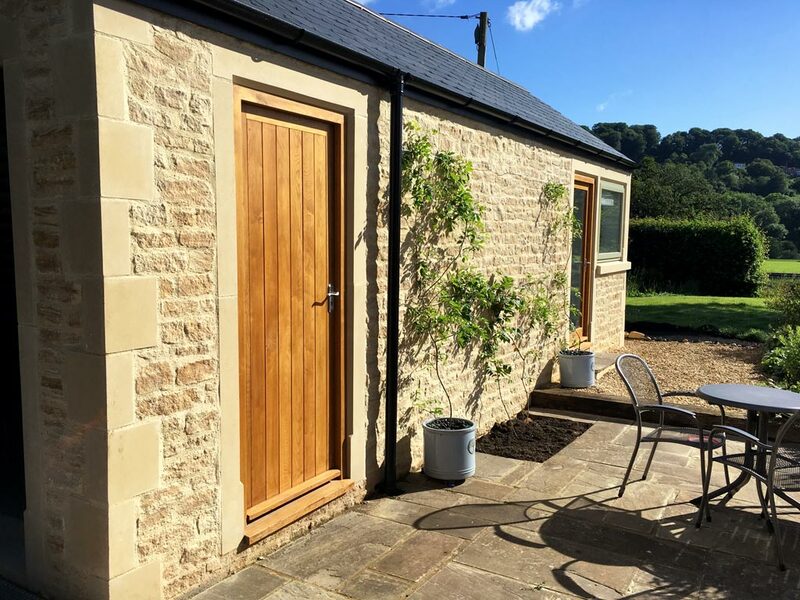 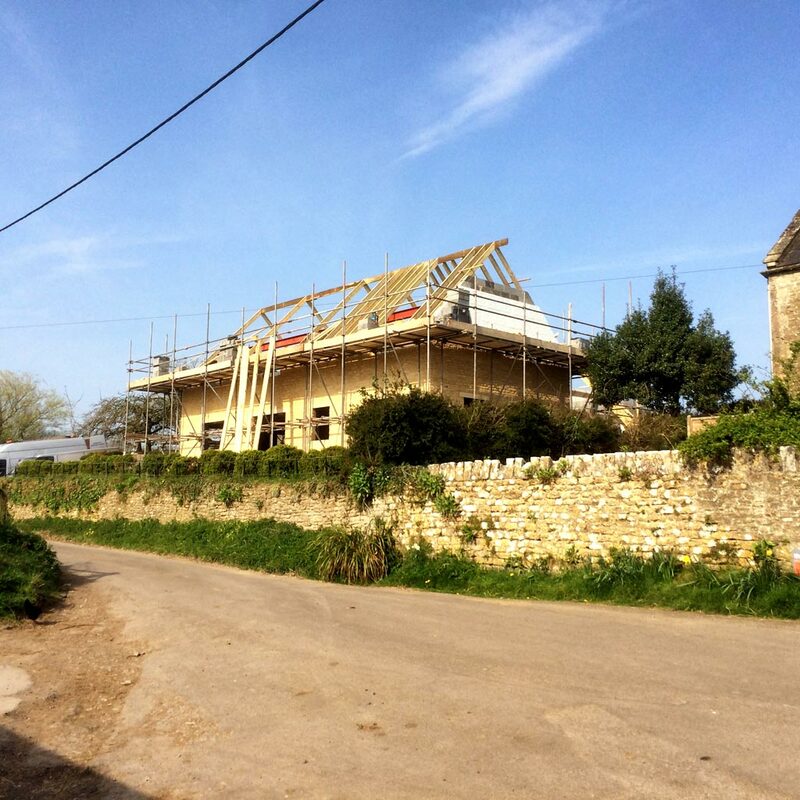 Lockleigh undertook to restore and rejuvenate a 100 year old cottage near the fashionable town of Bruton. 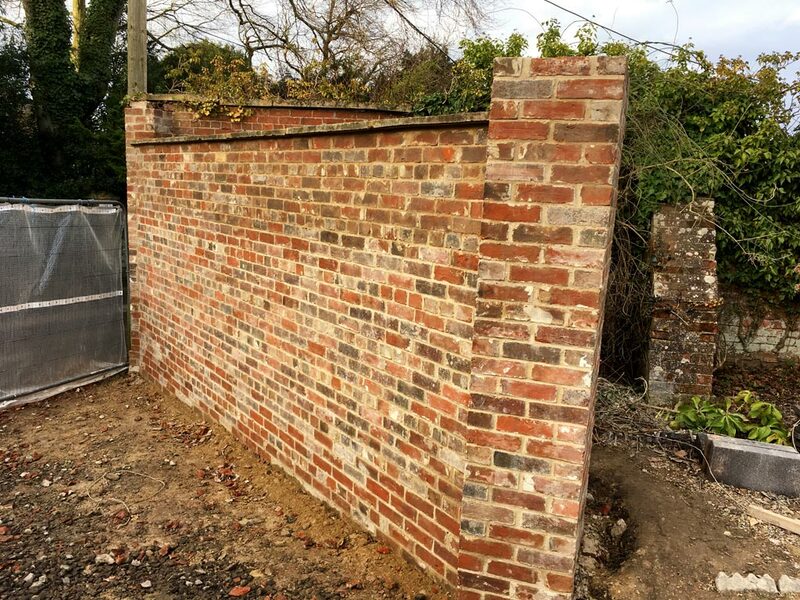 The external walls had been rendered and painted white, but the company removed this, cleaned the stone and then repointed in lime mortar. 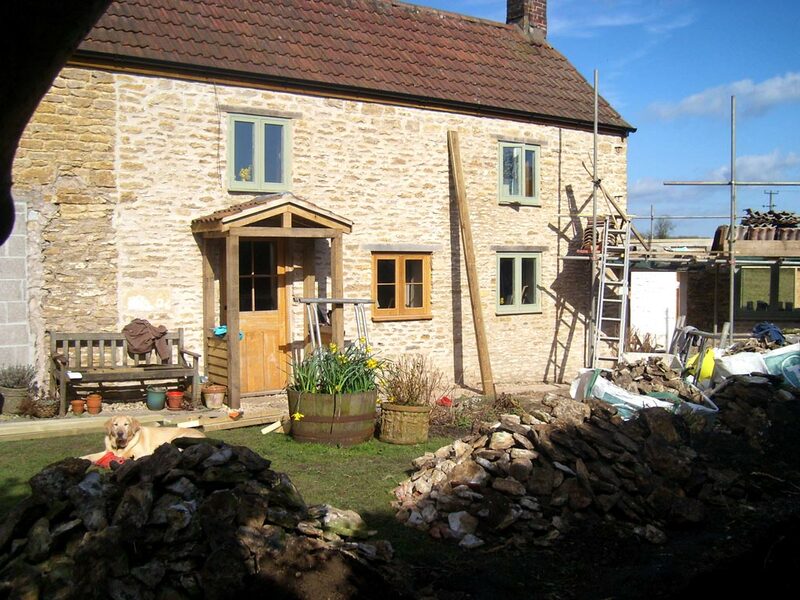 New oak windows were installed in place of the tatty old ones. 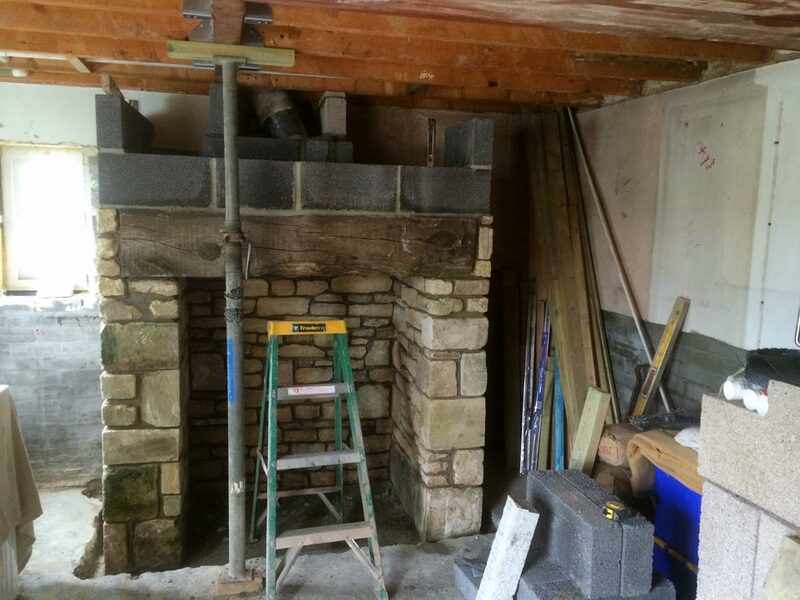 Inside the restoration was just as extensive. 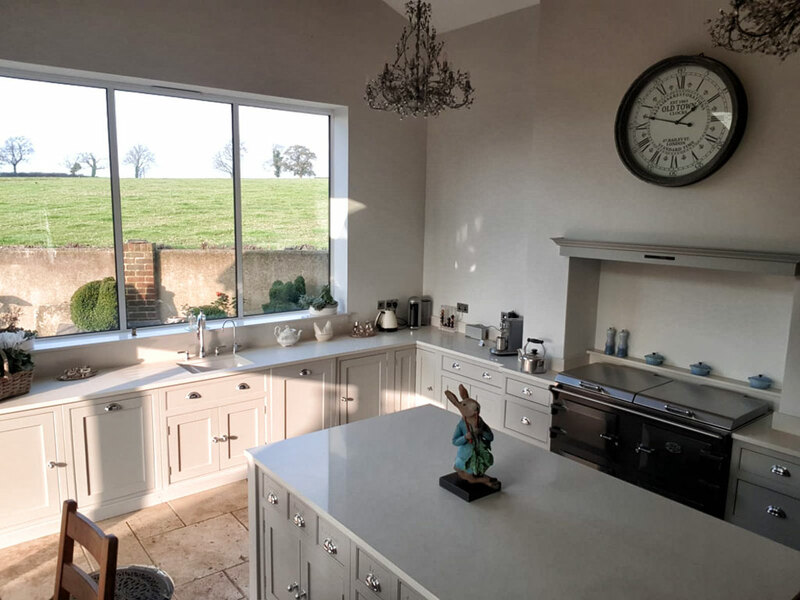 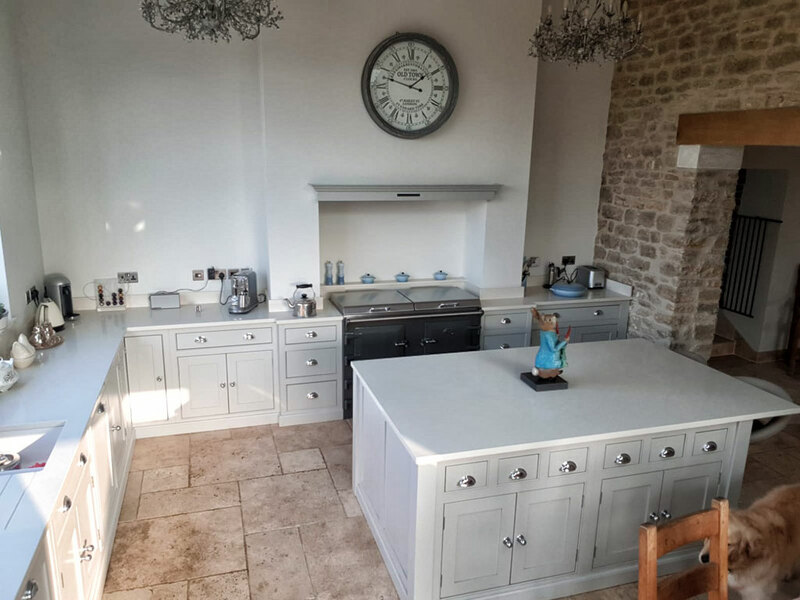 The kitchen was moved into a former cow shed, while the former kitchen was incorporated into an adjoining room and turned into a large living space. 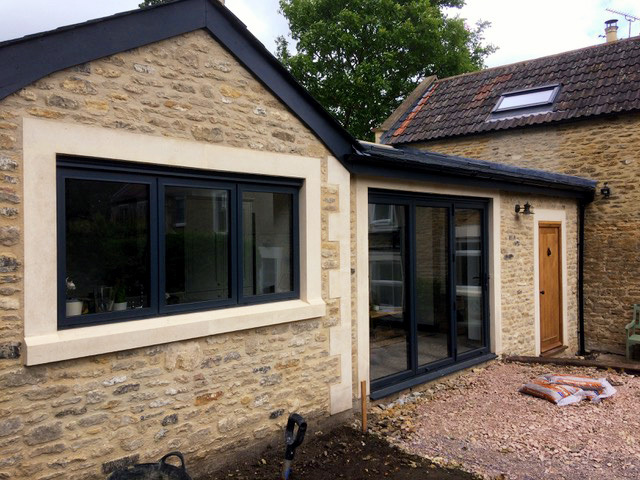 The company also built a two-storey extension to the rear. 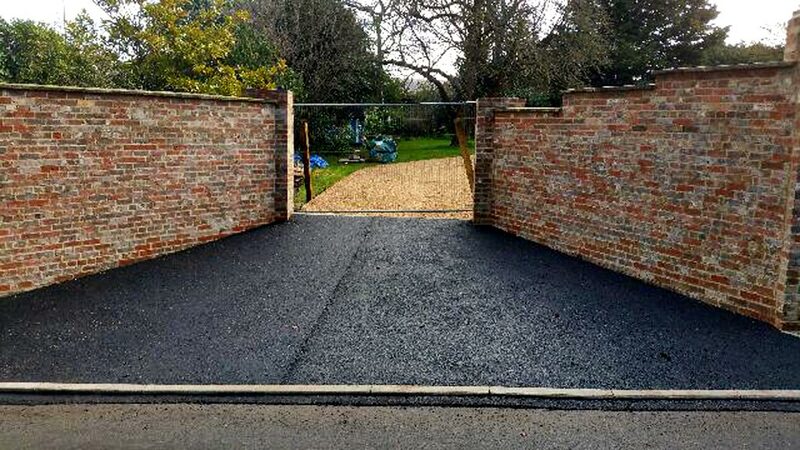 In this project the client wished to change the entrance to his house. 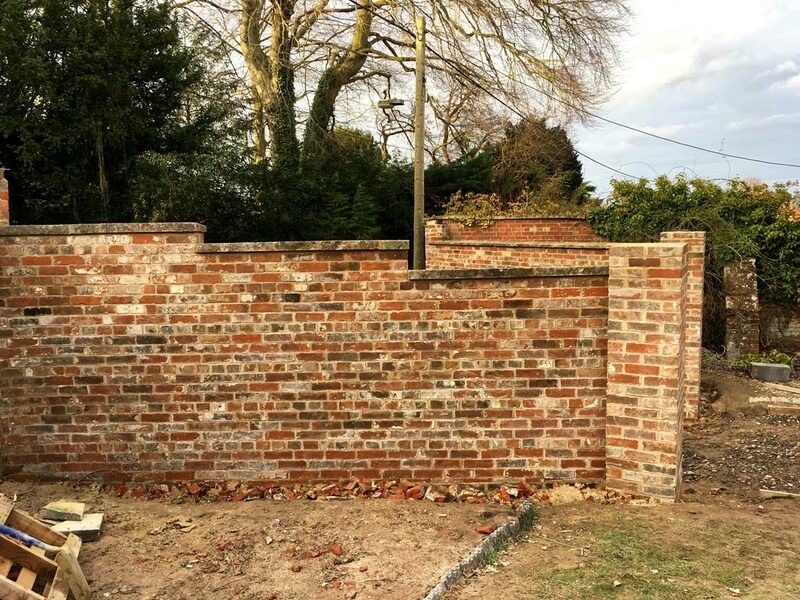 The job involved taking down the existing wall and rebuilding it with the same reclaimed imperial bricks into a splayed entrance. 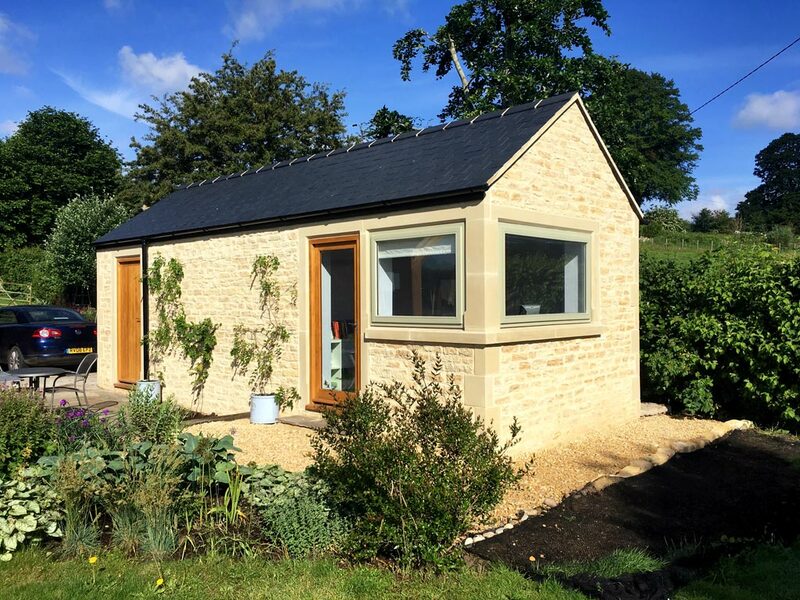 To complete the smart look a Bath stone coping was placed on the top. 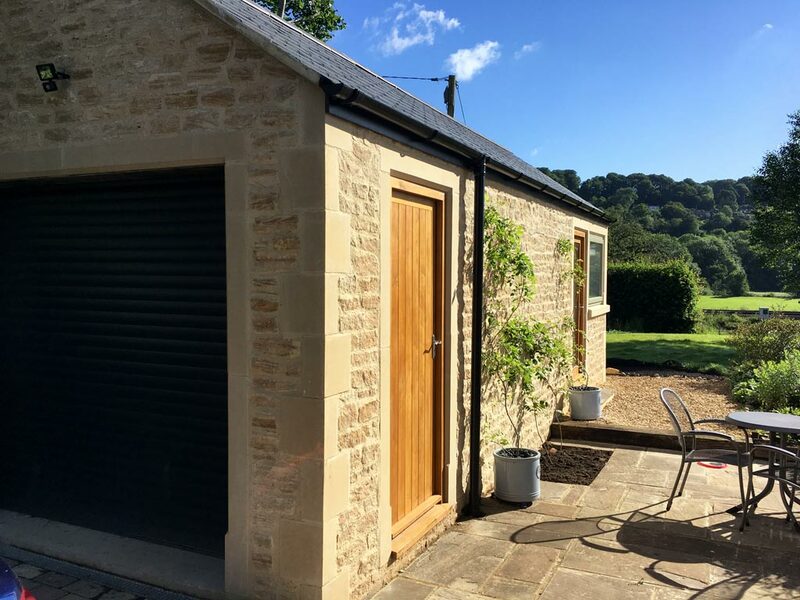 This 3x9m extension with bi-folding doors brought with it considerable access problems. 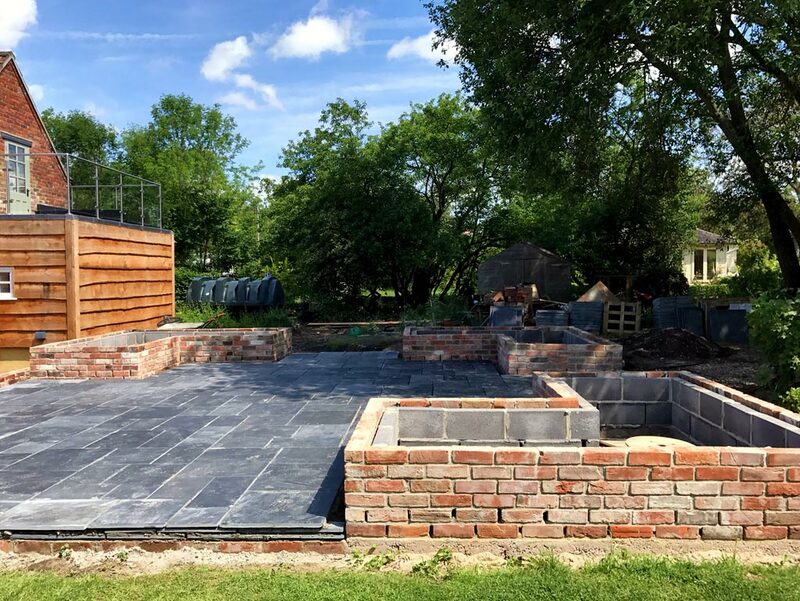 It wouldn’t have been every builder’s dream job, but Lockleigh loves a challenge. 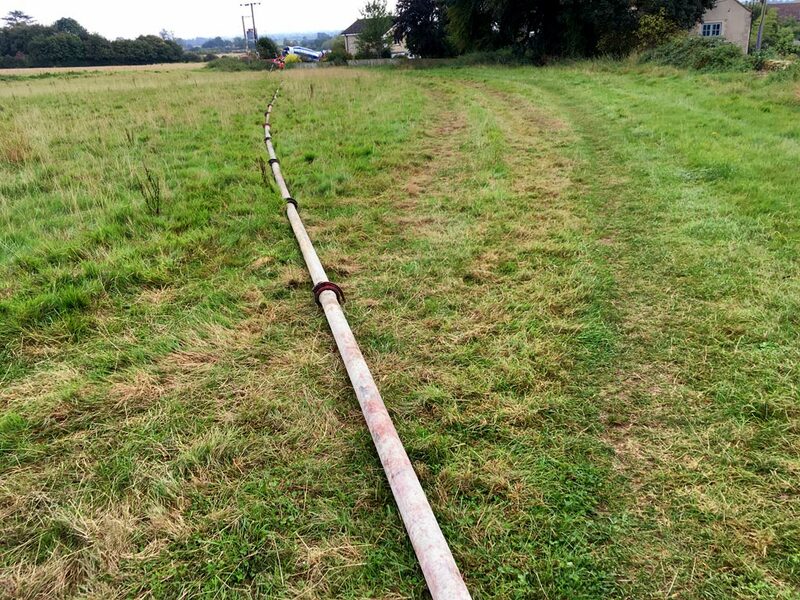 The property was reached via a 170m pathway through a field and following excavation of the foundations, the concrete for the foundations had to be pumped this distance from the road. 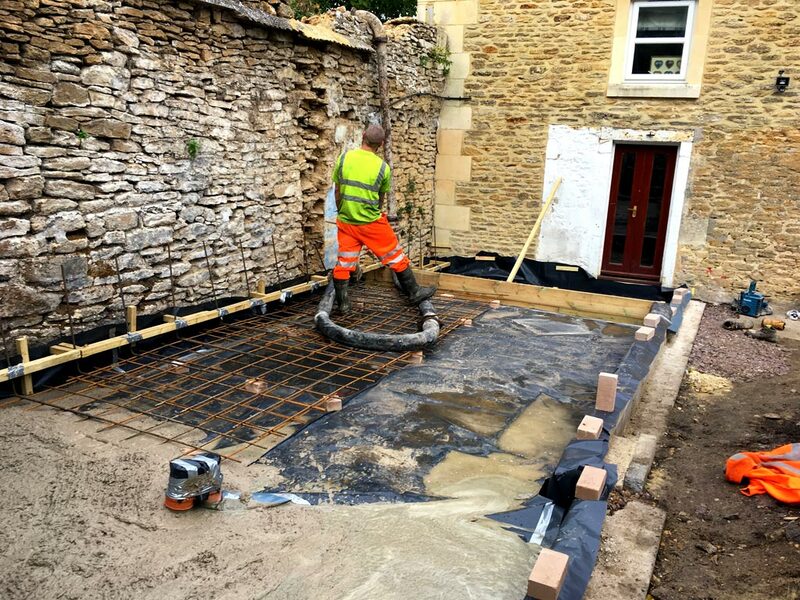 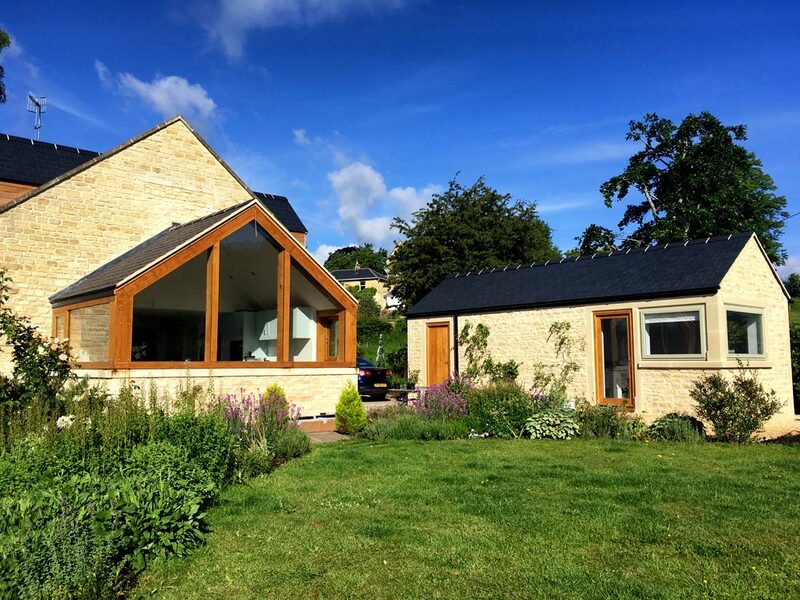 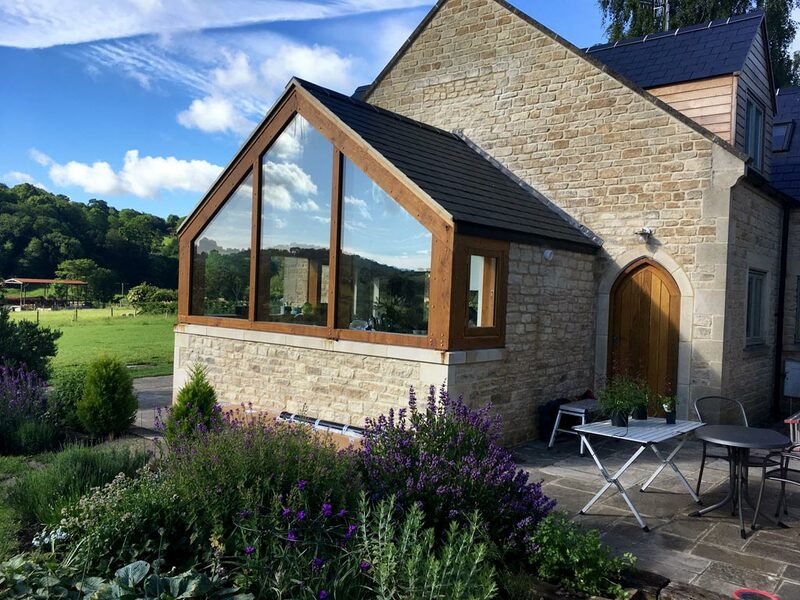 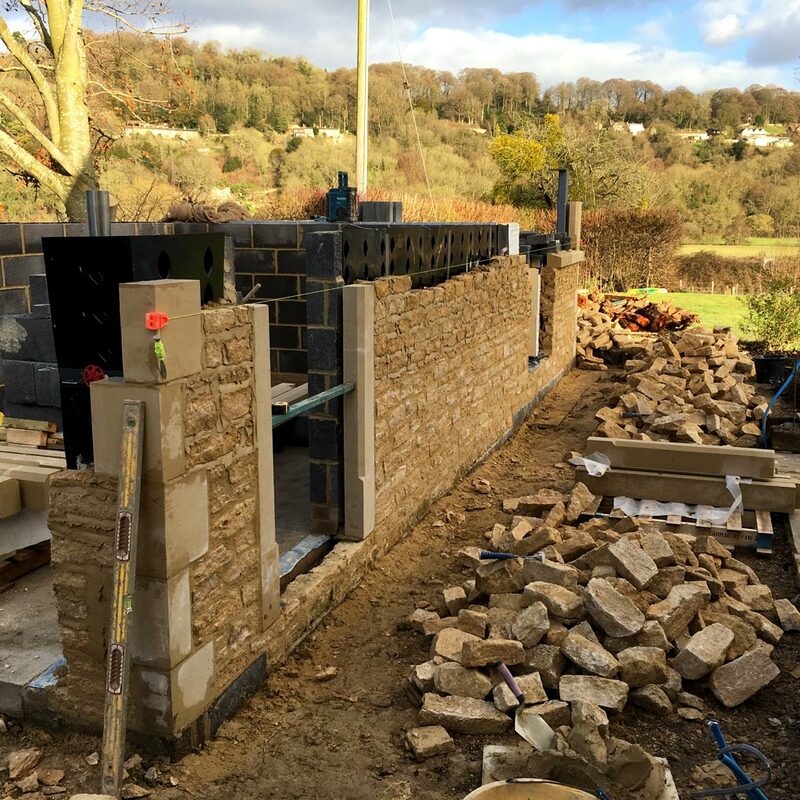 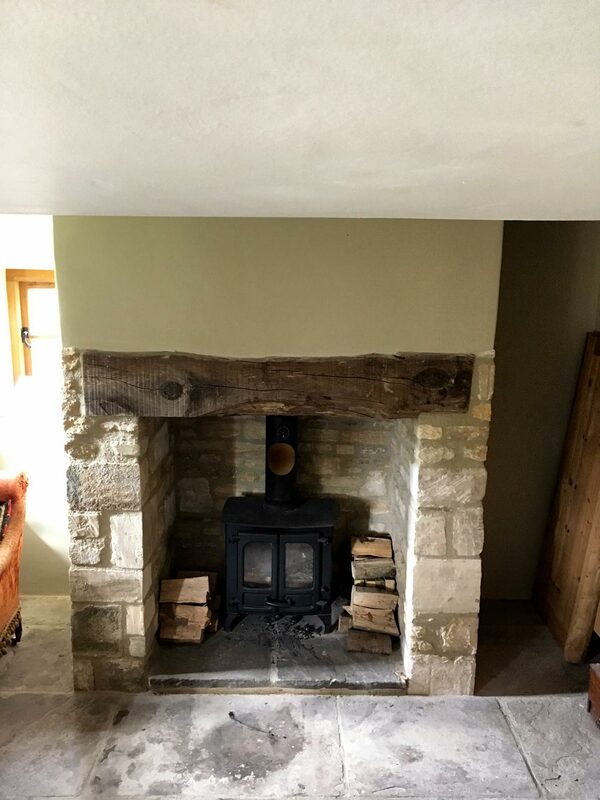 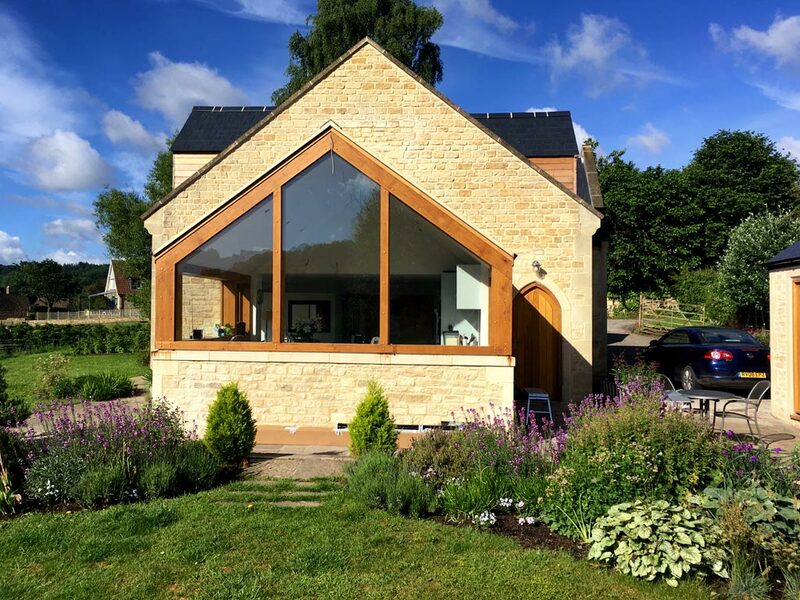 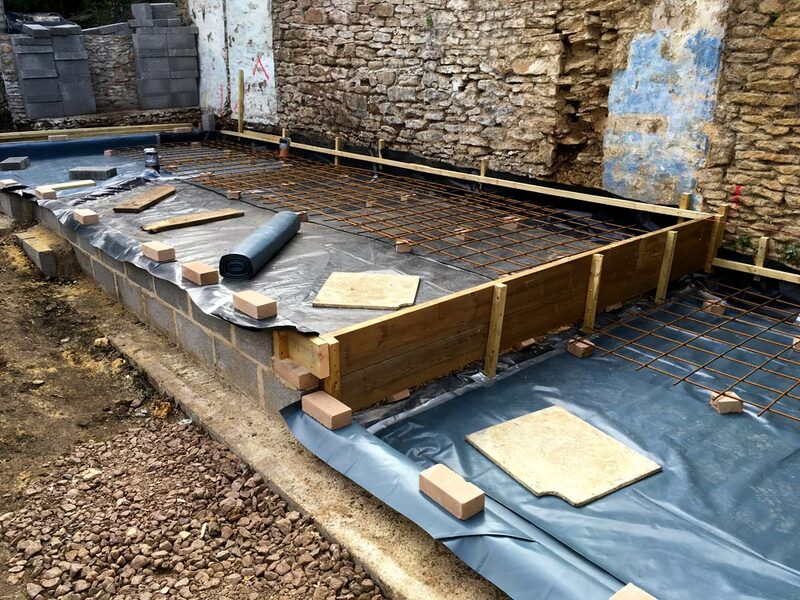 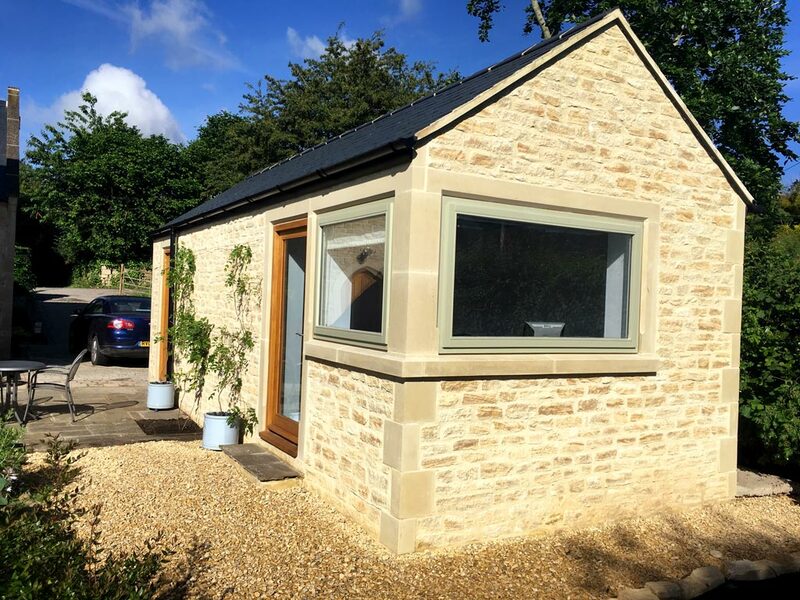 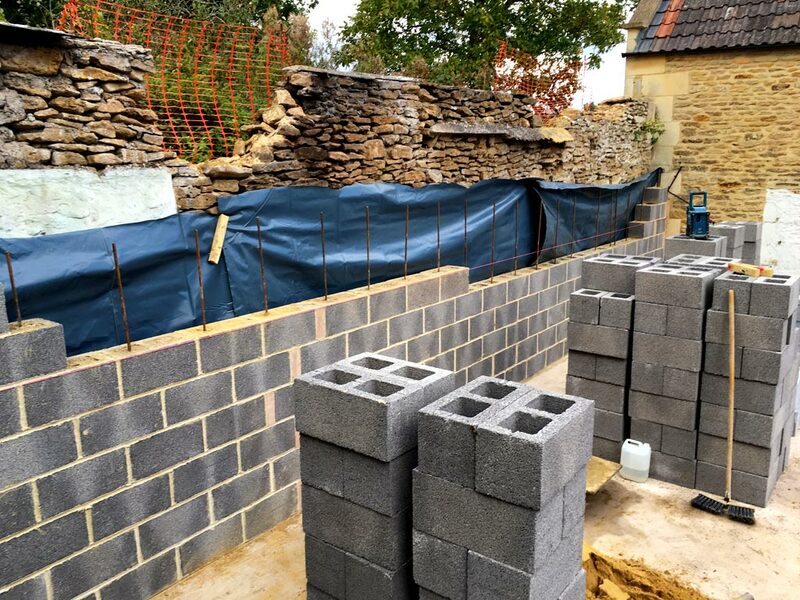 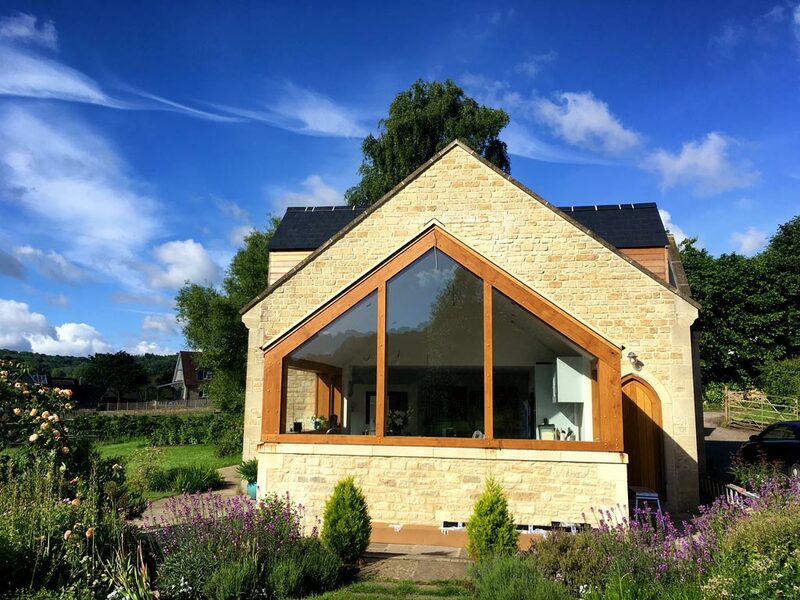 Rob and his team then had to build a reinforced concrete block retaining wall to hold back the various ground levels before they could commence construction of the extension, which boasted a vaulted ceiling and which was completed in reclaimed natural stone. 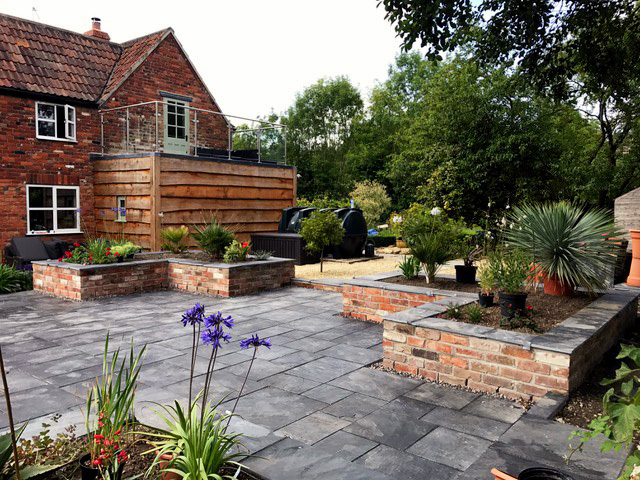 The original site had raised beds, which the client instructed Lockleigh to remove. 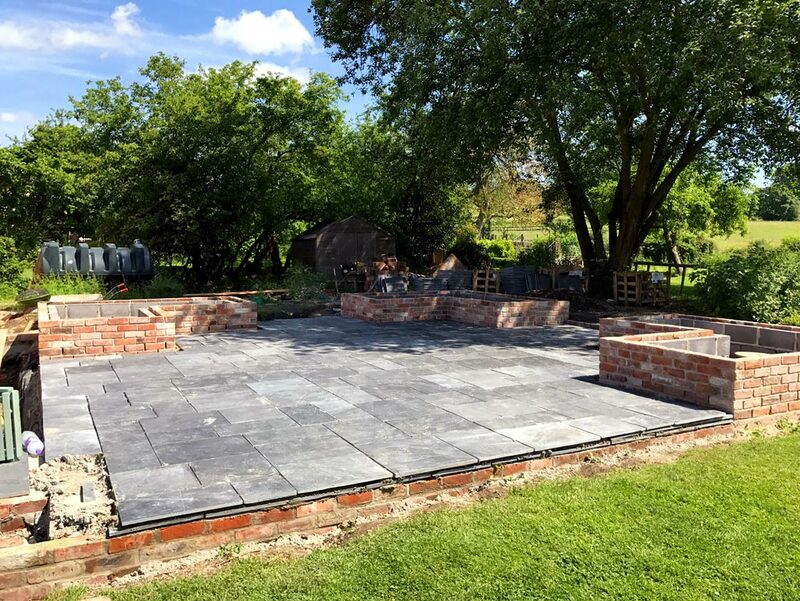 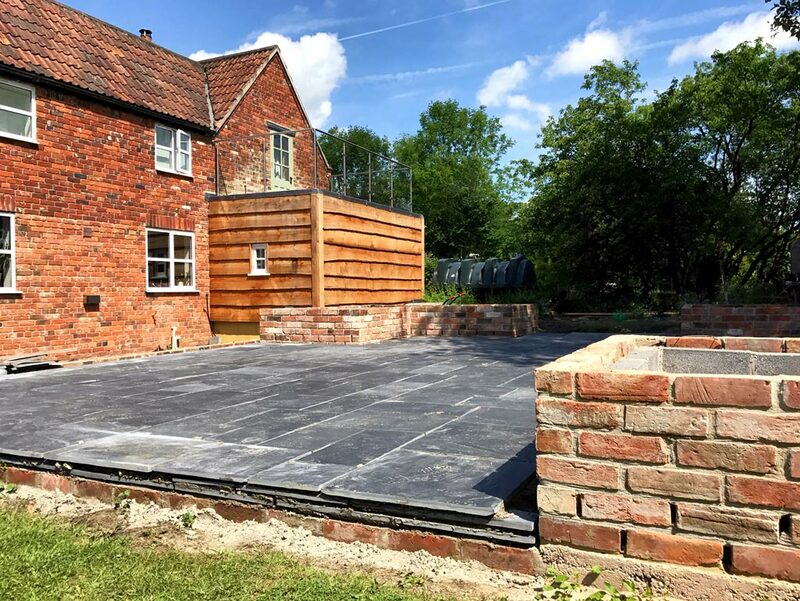 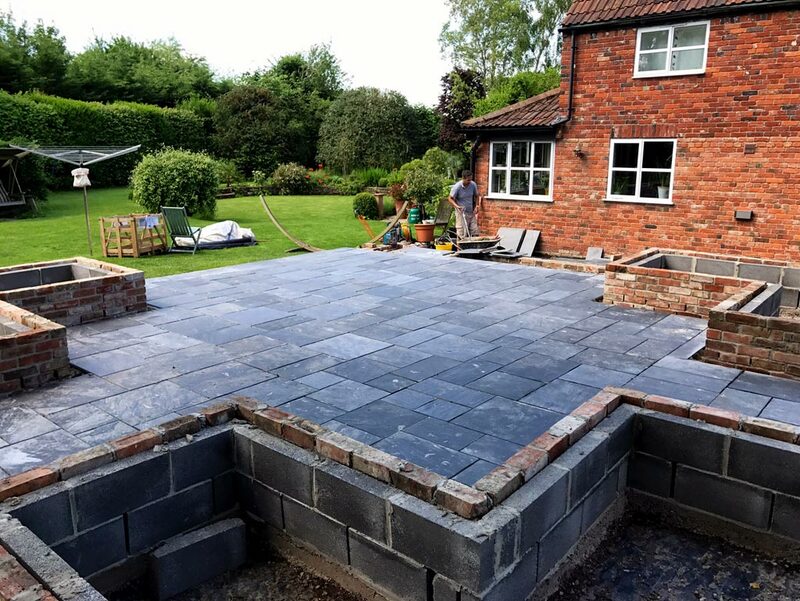 After clearing the site, the workforce prepared a sub base and then laid a 9x9m slate patio incorporating traditional reclaimed brick planters. 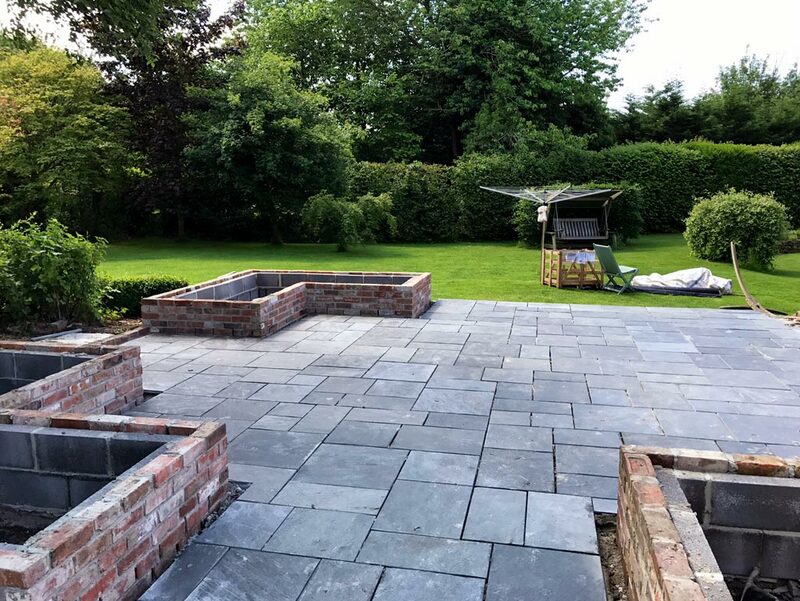 Once all this was completed, the slate coping on top of the stonework finished the job off to perfection.